Back just before Christmas, Miss Penny was down here in Brighton for some holiday time with her family, and we took advantage of her presence in our fair city to hit up the Royal Theatre for the touring production of one of my very favorite campy musicals, full of transvestites, catchy tunes, a man in gold hot pants-The Rocky Horror Show! Penny bought me a ticket as a Christmas present, because she is a wonderful person. Lucky me, right? She and I knew that we wanted to dress up (which, in case you were thinking about it, getting all slutty to go to the theater on the Sunday before Christmas is an exercise in awkward, let me tell you), but were surprised that when we showed up to the show, not that many people had taken the opportunity to role play! Their loss. We found our people, nonetheless. I mean, look at these folks. They were drunk with a Capital D. And they were fun. Doesn’t Penny make the absolute best Magenta? I was torn when it came to picking my own costume, because I’d planned to give it a go as Magenta, but Penny’s hair….she was born for it! 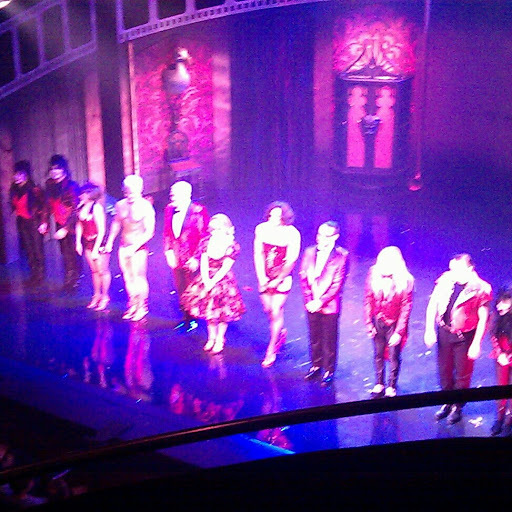 So I played up my blonde ingénue qualities and Janet and Magenta made their way to the big show. It was, in a word, uncomfortable, getting the bus over there. Felt like everyone was staring at us (okay, more at Penny than me-I just look like I enjoy showing a little leg and aren’t aware that tights are called for at the end of December, even in mild England). We stood out on this particular Sunday, is what I’m saying. The performance itself was great, but we were disappointed by the lack of audience participation and general sing-along. I guess that’s more for the midnight showings, eh? Ah well. We had a really fabulous time, and got to dress up, meet new people, and hang out, and it was super fun. Yay for musicals! oh….and Penny wore these shoes. How crazy are they??! Brave gal, that one. Next time I’ll be hitting up a midnight showing for sure. I want the raucous, full-on experience, with toast throwing and “rain” and shouting at the screen. Can’t wait! So impressed by your braving public transport in fancy dress 😉 I did it a few weeks ago in a flapper costume which is far less brave, but still made me feel oh-so-conspicuous. 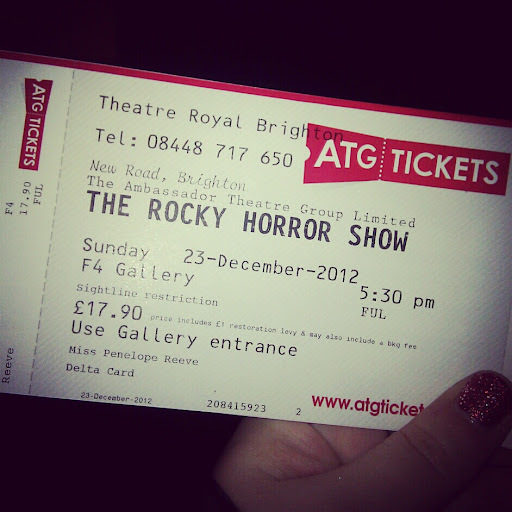 Sadly, I’ve never seen Rocky Horror (the musical or movie). There is a movie theater in Atlanta that plays it at midnight every Friday — Cath’s been — can’t believe I’ve never made it. You two look gorgeous! And love your new friends — talk about brave — man with the gold hot pants, I’m looking at you!